Based in the village of Vho on the outskirts of Tortona, or Derthona as the Romans called it, among the pretty, calcareous clay, Marne Sant’Agata hills, La Colombera is a third generation, 22 ha property planted notably with the indigenous white wine grape Timorasso; all within a mile of the winery. Pietro Semino & his family, including son Renato, first arrived here in 1937, from Montemarzino, to be close to the town; here they started growing wheat, chickpeas, rye & grapes. Renato’s son Piercarlo, father of Elisa & Lorenzo, husband of Luisa, was born in 1955, & would be the first generation to focus on the wine. In 1961 Renato planted the first of La Colombera’s vineyards: Vigna Brusa. During the 1970s, Piercarlo began working the vineyards & decided in the 1980s to begin making wine himself, rather than sell off the fruit, building a winery in 1996. The next opportunity came with the outbreak of flavescenza dorata that decimated the largely rented vineyard, encouraging them to plant Timorasso for the first time in 1997. Then in 1998 they took the bold step of buying their vineyards before bottling their first vintage in 1999, A new cantina/winery was installed in 2000. 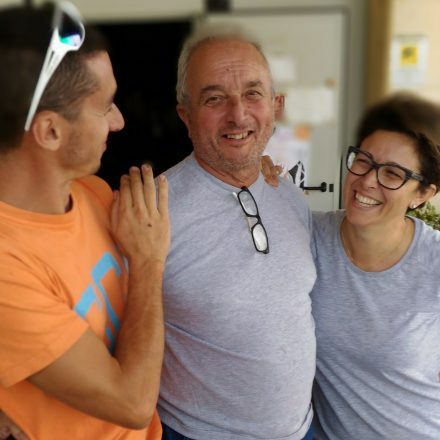 In the same year, daughter Elisa returned from her viticultural studies in Milan to join the family business & to focus the family’s energy on producing Timorasso. In vintage 2007 they released their first single vineyard Timorasso ‘Il Montino’. In 2013, Elisa’s brother Lorenzo joined the family business, & in 2014 for the first time they fermented the Timorasso wines, Derthona & ‘Il Montino’ using wild yeasts (bringing more purity). In 2017 they’ve added three new hectares. 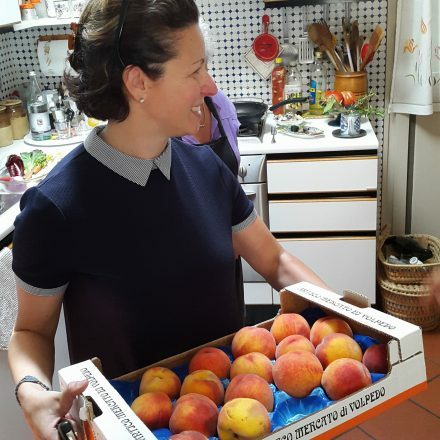 And when not bottling peaches with her mother, Elisa sets a demanding pace! 2017 ‘Bricco Bartolomeo’ Cortese – tasted April 2018. 100% Cortese from Tortona, on calcareous and clay soils. 100% stainless steel to maintain crispness and freshness. Citrus, nectarine and little white flowers. On the palate, juicy with good acidity and balance. 2017 Derthona Timorasso – whole bunch, wild yeast, fruit from four vineyards of essentially Marne Sant’Agata soils (light – brown), planted between 1998 – 2000, at 260 -300m asl, winter on the lees…from bottle: Riesling esque! Corn flower, lime sherbet/nectarine, peaches with syrup! Tasted April 2018 – closed at first on the nose but opened up on the palate. Very mineral, tight, pure. 2006 Derthona Timorasso – tasted Sept’17, the final vintage when all the Timorasso vineyards were blended together (in 2007 ‘Il Montino’ was separated out); gleaming gold, focussed rich petro-carbon, real candied lime botrytis, sciropo, intensity, ginger root, cologne lift/fresh, white musk, mushroomy/boleto complexity, incredibile! So fine, fluido, great 2nd phase, white currants, lime purity, a perfect example of why Timorasso is sought after! 2015 ‘Il Montino’ Timorasso – tasted April 2018, from the single Il Montino vineyard on grey clay/marne, planted in 1998, 100% stainless steel, wild yeasts only, with 10 months on lees, and some battonage. 12 mths bottle age before release. Riesling-esque in concentration and complexity, with exotic fruit and citrus aromas, a hint of honey and lime blossom. In bocca: an intense lime focused core, a hint of residual sugar (5g RS) paired with good acidity to give it an extra lift. Intriguing and delicious. ‘Vegia Rampana’ Barbera 2016 – c.10k bts, gorgeous inky purple, pure Spanish plum, fantastic, fruit salad richness & expression, che gioia! hint of black pepper, sumptuous, spremuta/press of prune!